Be authentic: When choosing a controversial subject, be sure that it fits completely with the company’s values and mission. The larger the gap between the issue and the values of the company, the more room for backlash. Be honest: Consider why you’re really getting involved. Is it to display a public commitment to an issue that matters or is it to garner media attention? If the issue does not relate back to the company’s mission, it will be perceived as insincere and considered a media stunt. Stand your ground: Be willing and able to support the issue completely. If you’re going to take a stand, you must support it through and through. Be prepared for negative feedback: Not everyone is going to agree with your stance, or the fact that you’re taking one. Consider how your position will affect your partners, employees and customers. Realize that your actions may cost you customers in the end. It may seem easy enough, but when getting involved with controversial issues that put your company on the line, it can be hard to pull the trigger. However, it can be done successfully. 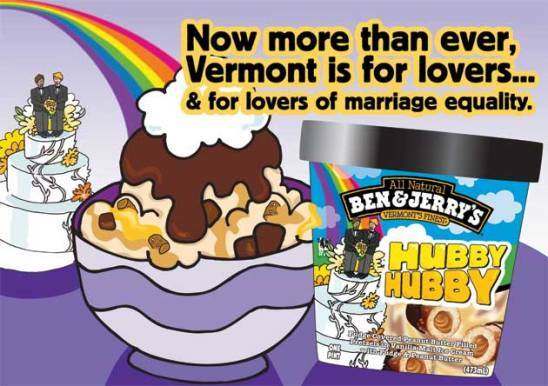 For example, Cone recently helped Ben & Jerry’s take a stand in support of the legalization of gay marriage in its home state of Vermont. For the month of September, the iconic ice cream company symbolically changed the name of its well-known Chubby Hubby flavor to “Hubby Hubby.” Ben & Jerry’s has a long history of commitment to social justice issues, including gay rights, so supporting the controversial issue was a natural fit for the brand. By tying into a timely event and communicating in the brand’s authentic tongue and cheek manner, the announcement increased awareness of the issue by garnering extraordinary media attention and furthering debate, which is exactly what Ben & Jerry’s intended.